I am so grateful for every picture that we have of our dear daughter. We had professional pictures taken immediately after Caroline was born and the day before she died. I am ever grateful for those precious memories frozen in time and the photographers who stood by our side. I placed something in Caroline’s hospital bag that I didn’t know if I would use. A week or two before her due date, I had the idea to get a chalkboard and decorate it with her name and pink baby stickers. The idea was to update the chalkboard with how old she was and to take pictures of her with it. It would give us a way to look back and know how old she was each day. We knew of the strong possibility of not getting a chance to take chalkboard pictures, but we hoped and prayed for some time with our little girl. We were so thrilled to be given time together! In the hospital, we started by taking pictures of us, Caroline, and her chalkboard every few hours. Soon, she had survived her first day, and the chalkboard proudly read, “I made it through my first day!” Every day from then on, we took a chalkboard picture. “Caroline is 5 days old!” “Caroline is 1 week old!” “Caroline is 22 days old!” “Caroline is an 8 week old inspiration!” “Caroline is 58 days old!” Each day, her chalkboard age declaration ended in an exclamation point, because we were thrilled to be witnessing the miracle before our eyes. Every day, minute, and second was such a gift. We always waited to do Caroline’s daily chalkboard picture until we had a visitor or when Caroline was most alert. In the progression of pictures, she gets more alert the older she gets. It was amazing to see her grow and interact with her world. We made a collage of all of the chalkboard pictures, and it shows how loved she was and still is. Every person who was able to visit was thrilled to be in the chalkboard picture, and the collage reminds me how loved Caroline is by so many people. Love you forever and ever, Miss Caroline. Categories: Memory Monday | Tags: alert, chalkboard, gift, hospital bag, love, memories, miracle, pictures, time | Permalink. Caroline’s hospice nurses helped us to make memories with Caroline. They brought plaster to make molds of her hands and feet. It was quite the production – the two of them were in our kitchen, trying to mix the molding material to the right consistency. My husband gave them a bowl to use and on the first try it hardened almost immediately. The second try was slightly more successful. The cats were very interested in trying to sniff the material while we plunged one of Caroline’s hands and one foot into the mold. I was nervous about the hand mold, because Caroline’s sixth finger was so delicate, but we gave it a try. It turned out that the hand mold was the only one that came out well. We were able to remove her pinky from the mold with no problems! We then filled the mold with plaster and let it dry. The extra pinky was not replicated in the plaster, but we still have the mold of the rest of Caroline’s hand. It is beautiful, but missing a piece. Since we had so many problems with the plaster molds, the nurses found another keepsake to make. It was a picture frame where one side is clay to make hand and foot imprints. We did this one on our own when Caroline was 4 weeks old. I had the hardest time getting the clay flattened out in the frame and ready for prints! My husband helped me and finally it was ready. We brought Caroline into the kitchen and my husband rested her in the cat beds. She looked so comfortable! 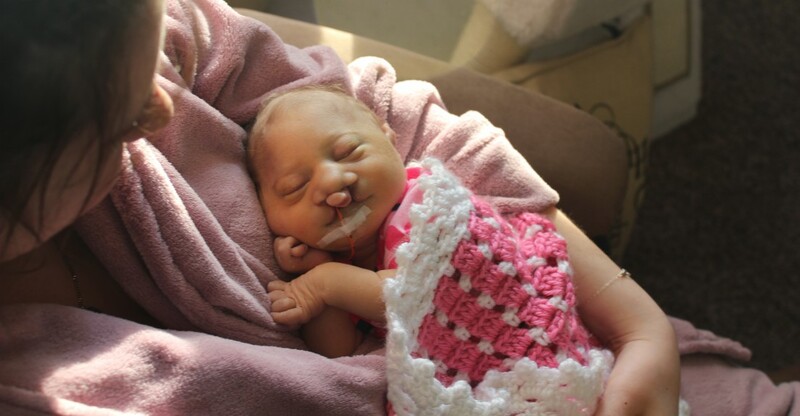 We pressed her hands and feet into the clay and wrote that she was 4 weeks old. We then baked it to harden the prints. That frame now proudly sits in our living room. The final act of great kindness by our hospice nurses was to arrange a photographer to take pictures of us as a family. She volunteered to take pictures at no cost to us because she had lost children too. We set a date for the pictures and arranged Caroline’s feedings around it so that we could remove her og tube for the pictures. We picked out a few outfits – a sailboat-themed outfit was up first. It was incredibly adorable and my husband found a matching shirt that was blue with white sailboats in contrast to her white with blue sailboats. I picked out a white shirt to wear for those pictures. We didn’t know how many more outfit changes we would get out of her, especially since we had to schedule the photo shoot during her typical fussy time. However, we got to the park and she was incredibly calm for the pictures! She loved being outside and feeling the sun on her skin. We ended up getting two more changes out of her, into a ruffled romper that I had bought before she was born for pictures, as well as a flowered onesie. Since Caroline was so calm, we were able to get some pictures with my parents as well, who were visiting. Those pictures were taken the day before Caroline died. We are so grateful for them. I couldn’t wait to get them once they were ready. It was hard knowing that they would be the last new pictures of my baby girl, but I am so thankful that we have professional family photos. 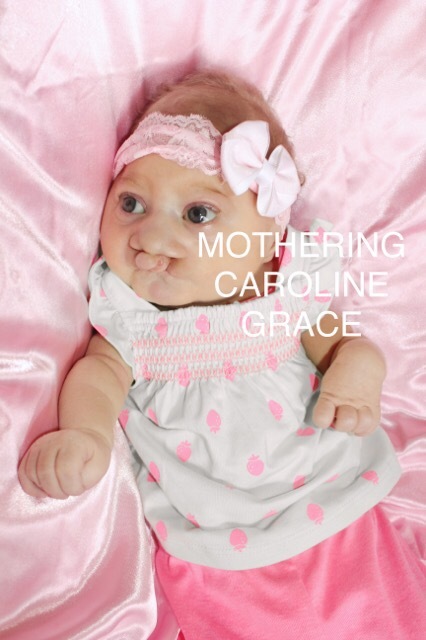 Thanks to our hospice nurses, we have beautiful ways to keep Caroline’s memory alive in our hearts. Categories: Memory Monday | Tags: extra pinky, footprints, hand prints, hospice, hospice nurses, love, memories, mold, pictures | Permalink.